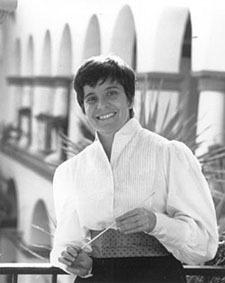 Karen Keltner served for more than twenty five years as Resident Conductor and Music Administrator of the San Diego Opera, for whom she has conducted many productions, including Cold Sassy Tree, Of Mice and Men, A Streetcar Named Desire, Salome, Die Zauberflöte, Le Nozze di Figaro, Faust, Les Pecheurs des Perles, Don Pasquale, Il Barbiere di Siviglia, L'Italiana in Algeri, The Love for Three Oranges, La Perichole, Rigoletto, Der Fliegende Holländer, Hansel and Gretel, Samson et Dalila, Tosca, La Boheme, Wozzeck, Les Pecheurs des Perles,, the American premiere of Peter Maxwell Davies' The Lighthouse, the west coast premiere of Therese Raquin, and the world premiere of The Conquistador by Myron Fink, among others. As a guest conductor, she has appeared on the podium of The Washington Opera at the Kennedy Center in Washington, D.C. for Of Mice and Men Opera National du Rhin in Strasbourg, France and the Austin Lyric Opera for A Streetcar Named Desire, New York City Opera for La Boheme, Seattle Opera for Hansel and Gretel, Glimmerglass Opera for Yeoman of the Guard, Nashville Opera for Don Pasquale, Opera Carolina for Aida, Carmen, Il Barbiere di Siviglia, La Traviata, Tosca, and Salome, Pittsburgh Opera for Lucia di Lammermoor and Il Barbiere di Siviglia, Utah Opera for La Belle Helene and Die Entführung aus dem Serail, Opera Company of Philadelphia for Salome, Syracuse Opera for Aida, Orlando Opera for Les Contes d'Hoffman and Amahl and the Night Visitors, Austin Lyric Opera for Madama Butterfly and Carmen, Opera Columbus for La Cenerentola, Manitoba Opera for Madama Butterfly, Opera of Kansas City for La Boheme, Opera Carolina for Cold Sassy Tree, Chautauqua Opera for Cosi fan tutte and Don Pasquale, and the Eastman School of Music for The Mother of Us All. For several years, she served as Principal Conductor of Anchorage Opera and conducted a number of productions for them. Next season, she will debut with Hawaii Opera conducting La Boheme. A native of Indiana, Ms. Keltner studied music and conducting at Indiana University, where she earned a B.A. in French, plus B. Mus., M. Mus., and D. Mus. degrees. She studied conducting with Fiora Contino, Julius Herford, Tibor Kozma, and Walter Robert. Ms. Keltner is also a graduate of the University of Strasbourg in France and speaks fluent French. The first young conductor to ever receive a National Opera Institute apprenticeship in 1981-82, Ms. Keltner is also received a Skaggs Foundation grant for study of opera performance in Europe. She previously served as Assistant Professor of Music at the University of Central Florida in Orlando and also Assistant Conductor for the Brevard Symphony in Melbourne, Florida.